Perceptual bias caused by sequential dependence has attracted lots of attention recently. The phenomenon is not new. For example, 150 years ago Vierordt has found a classic central tendency effect using duration reproduction. However, recently Stefan Glasauer and me looked into the original study conducted by Vierordt (1868), and found actually Vierordt wrongly used the method developed by Fechner (1860). That is, Vieordt introduced randomization in the ‘method of average error’ that Fechner invented. 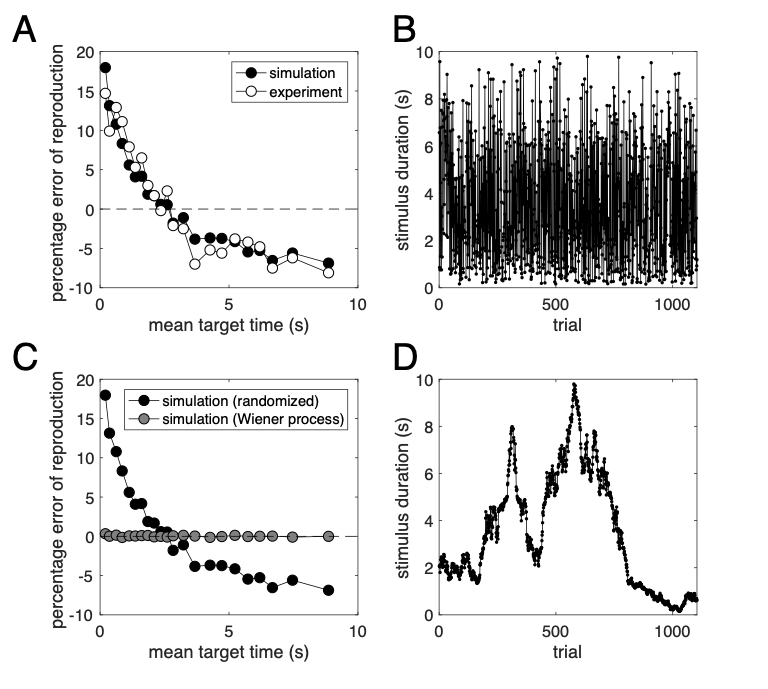 Using iterative Bayesian updating we are able to replicate the original Vierordt’s results. More interestingly, we found that the randomization is the main factor that causes the classic Vierordt’s law. That is, the short duration is often overestimated and long duration underestimated. We conducted a new study with two different sequences, sampled from the same distribution, and found the sequence with random walk generated far less central tendency biases . Glasauer S, Shi Z. 150 years of research on Vierordt’s law – Fechner’s fault?, 1. This study has been uploaded to BioRxiv. You can find the study there ( https://doi.org/10.1101/450726).